On March 13, 2017, Dr. Renetta Tull gave a presentation at the 61st Edition of the Commission on the Status of Women (CSW), in the side event entitled “Women’s Empowerment in the Engineering World.” In this global event, Dr. Tull was invited as a keynote speaker by the Director General of UNESCO Mrs. Irina Bokova. 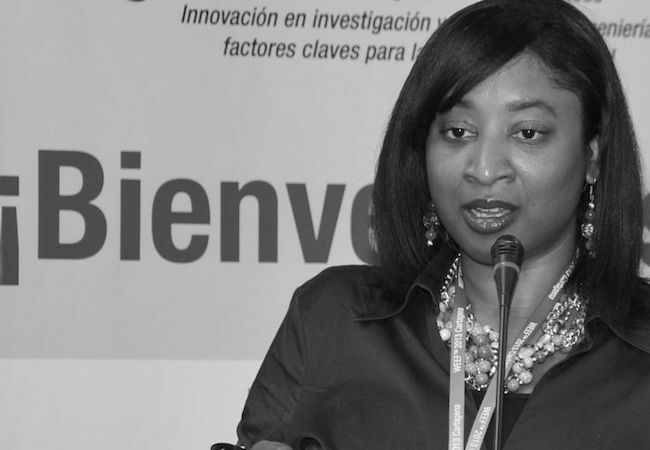 Currently she is serving as the Vice President for Initiatives in the Latin American and Caribbean Consortium of Engineering Institutions (LACCEI) and as the Associate Vice Provost at the University of Maryland Baltimore County. In her statement delivered at the United Nations, Dr. Renetta Tull focused on the role of Women in Engineering and their empowerment. She discussed NSF’s engineering statistics; The Jessica Effect [AAC&U Peer Review article on The Jessica Effect, PROMISE AGEP declaration of “The Jessica Effect”], NSBE (#BlackSTEMLikeMe Campaign), SHPE, AISES, LACCEI, and UMBC (About PROMISE: Maryland’s AGEP: https://promiseagep.com/). Based on research the participation of women in engineering is very low at the national level: undergraduate enrollment is 19.2% and graduate enrollment is 19.8%. Moreover, the numbers for women engineering students from underrepresented groups are even lower: 3.6% of enrollees. In her speech, Dr. Tull emphasized that: Women are role models and encouragers; They have the “power to empower;” Women, particularly diverse women, need to become professors to teach and empower new generations of women in engineering. Some of the highlights in her presentation were: Women in the professoriate can change attitudes about who can become an engineer; Women engineering professors from ethnic groups that are underrepresented in the discipline only comprise 1.4% of all engineering professors in the U.S.; Engineering Education Community must continue to nurture male champions; Think about the whole picture: respect in the lab, family and career-life balance, and provide opportunities to foster inclusive excellence. UNESCO has played a vital role for the organization of this session and setting forth a platform of a valuable discussion on women in engineering. Such an event raises awareness about engineering education and enables Women Engineers and University administrations dedicate more time towards strengthening the role of women in addressing global challenges. Moreover, in 2015 Dr. Renetta Tull was selected as one of the three finalists of the GEDC Airbus Diversity Award. Airbus Group and the Global Engineering Deans Council (GEDC) are united in their belief that both industry and academia need to actively encourage more diverse students to study and pursue a career in engineering. The finalists’ presentations were evaluated by the Jury based on their ability to channel a desire for more diversity in engineering into real, measurable change through an initiative that has the potential to be replicated elsewhere.